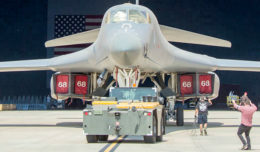 Construction has begun on the new Flight Test Museum outside the west gate of Edwards Air Force Base, Calif.
Construction has begun on the new Flight Test Museum campus outside the west gate of Edwards Air Force Base, Calif. 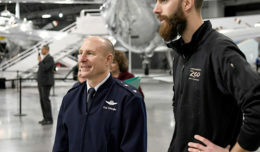 The project kicked off Jan. 8, with the re-positioning of the Boeing YC-15 Technology Demonstrator. The aircraft’s previous location was just inside the grading boundary of the construction site, making it necessary to move it to a safer location so the site preparation work could proceed. 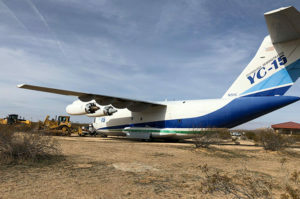 So, how do you move a large and very heavy, multiengine jet aircraft sitting on dirt? You use a Caterpillar D8 bulldozer, of course! Restoration volunteer, Doug Allen and grading contractor, Mark Norris, put their heads together and devised a plan to move the huge aircraft roughly 30-yards to the northeast and spin it around to face into the prevailing west winds. First of all, it was necessary to lift the plane off the pedestals that secured it to the concrete footings. Luckily, Marty Batura and his crew from Worldwide Aircraft Recovery had been at Edwards working on another project and were able to accomplish this task. Doug then had to prepare the plane for movement; checking the landing gear, tire pressures and removing the nose gear doors to allow the tow-bar to pivot the nose without destroying the doors. Then Mark brought in his heavy machinery. The D8 dozer was connected to the tow-bar and ever so slowly, the big plane was re-positioned to its current, temporary location. The entire process took 4 hours and was completed with zero damage to the aircraft. Once the movement of the YC-15 was completed, the crew from California Compaction Corporation began the process of the site preparation in what is called “Cut and Fill.” First removing all the vegetation and then cutting down high areas of dirt and filling in low areas, compacting the soil to make the site suitable for construction. Despite periods of heavy rain, the site preparation was completed on Feb. 8. Keep up-to-date with the project through the Air Force Flight Test Museum Facebook page and website!